Co-founded by David and Ann Wilson in 2003, Volunteers for China (VFC) is a Christian humanitarian 501 (c) (3) non-profit organization registered in the state of Tennessee. The organization is governed by a volunteer Board of Directors. Neither officers nor directors receive salaries; yet, all donate their time and resources in the support of the work of VFC. The Wilsons are committed to the concept of “making a difference in the hearts of Chinese students through friendship and the gift of English language”. Hence, the purpose of Volunteers for China is to facilitate the placement of Christian volunteers in situations where the love of Christ can be shown through teaching service. 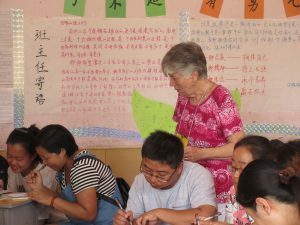 Volunteers for China (VFC) is dedicated to providing conversational English teaching opportunities in China. All assignments are designed to help Chinese teachers, students, and professionals improve their spoken English skills and learn about the culture and values of the United States. Assignments are short term (a few weeks) or long term (6 weeks or more). Lives can be transformed through the building of friendships between the Chinese and American participants. In the words of Ron Winstead, former China Consultant for the Cooperative Baptist Fellowship, “The Christian witness should be public and legal. Christians are to be salt and light and have respect for the law. We are to render to Caesar what belongs to Caesar, and to God what belongs to God. Jesus and Paul demonstrated and taught respect for government authority and that Christians should be model citizens.” Volunteers for China adheres to this basic theological assumption.